Delicate pastel colors grace this machine spun pewter urn. 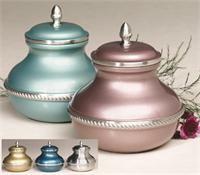 Metallic colors include Mauve, Green, Gold, Blue or Natural Pewter Finish. Surface is not engravable.